The Place Another new dining concept by Paradise Group, Le Shrimp Ramen is a fusion of Chinese La Mian and Japanese ramen with its first outlet at the basement of Paragon in Orchard Road. 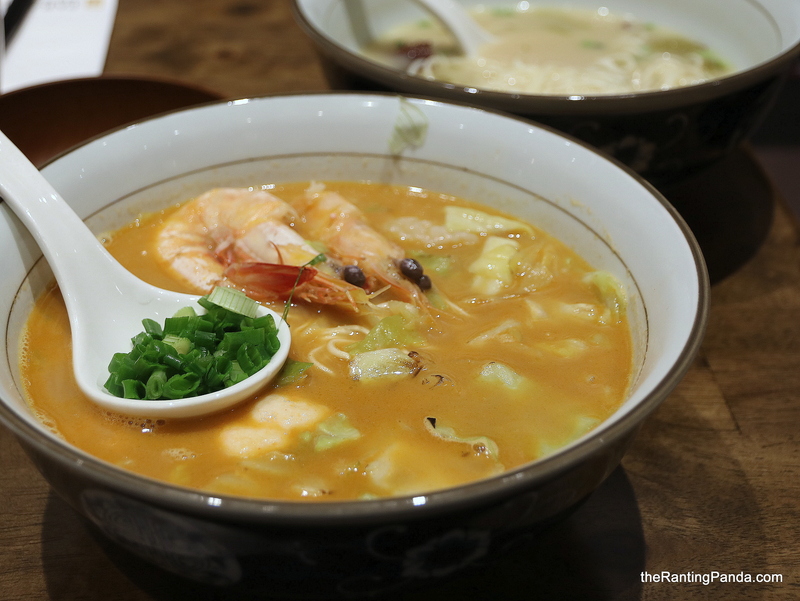 The setting of Le Shrimp Ramen is casual and there similar to LeNu by the same group, noodles is one of the focus. It is not a very big space, which makes it likely that there would be queues during peak meal hours. The new concepts by Paradise Group has been quite successful in recent years, especially one of my favourites Beauty in the Pot. The Food Noodles aside, the other big focus is shrimp. The signature is the Le Signature Trio Shrimp Ramen (S$19.90), which comes with handmade ebiko prawn paste, prawn dumplings and big prawns. My favourite is the ebiko prawn paste where the prawn flavour is quite solid. The broth is prepared for many hours with Chinese spices, and has a natural sweetness of the prawns with a pretty rich flavour. It is not cheap by La Mian standards but there are quite a fair bit of prawns here. The other noodle I tried was the Red Garoupa with Pickled Vegetable Tonkotsu Ramen (S$18.90). Unlike the Japanese tonkotsu broth I am familiar with, the first distinct difference is the slight spiciness in the broth here from the pickled vegetables. The spicy ramen broth is quite welcoming initially, and I enjoy the fresh taste and firm texture of the thick slices of red garoupa. That said, the broth does get a little salty towards the end which I suspect comes from the pickled vegetables. If you only have space for one side dish, I recommend the Twister Prawn Rolls (S$5.90). Thin and crispy, it comes with mayonnaise sauce and is extremely addictive. Rants No reservations are accepted at the moment. Will I Return Again? In most aspects, Le Shrimp Ramen complements LeNu from a Paradise perspective. The concept is quite interesting as it marries Chinese and Japanese elements. With its location right smack in Orchard Road, it makes a good choice for a casual meal in town.